Spin the reels of some hot slots with 100 free spins this weekend at Uptown Aces Casino, Uptown Pokies, and SlotoCash. Redeem the coupon codes listed below to claim 100 free spins on two different slot games and win up to $500 if your account qualifies. You can claim both free spin codes if you complete a deposit in between. Do not claim two free bonuses in a row or you will not be allowed to cashout and you will get bonus blocked. Only one account is allowed per household. Good luck! 50x wagering requirement on slots, keno or scratch cards; $500 maximum cashout. Max bet rule applies. Valid for February depositors. Do not claim two free bonuses in a row. 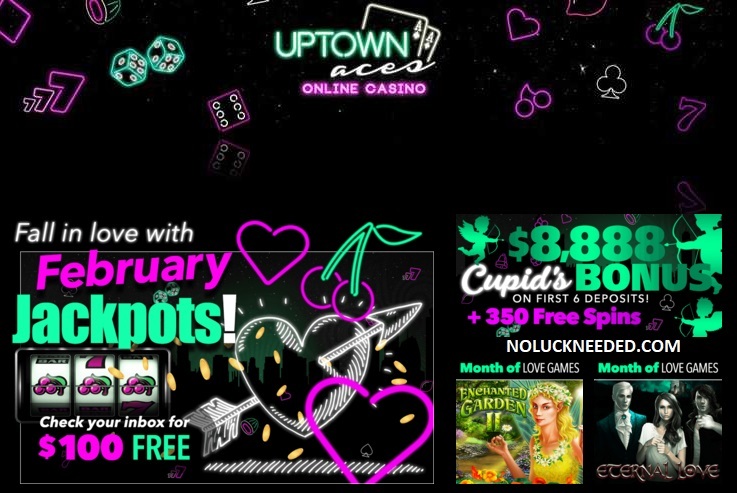 Claim Your Weekend Free Spins at Uptown Aces Casino!